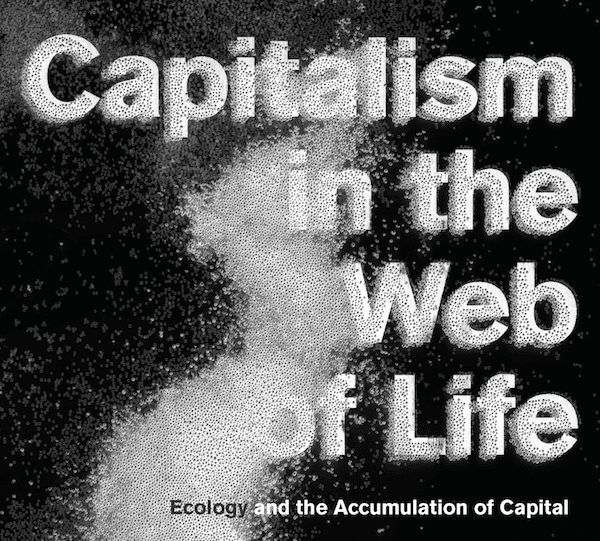 Jason W Moore’s Capitalism in the Web of Life sets itself the challenge of locating an account of capitalist commodity production inspired by Karl Marx within the biological, chemical and geological totality we normally call “nature”. The ambition of the book is therefore immense. Moore proposes a method for understanding world history that shows how economic development is connected to “long-wave” ecological transformations. At a time when humanity faces profound and simultaneous ecological and economic crises, Moore proposes a kind of meta-theory that explains them as the outcomes of a single logic. Ultimately, however, Capitalism in the Web of Life fails to provide a satisfying account of what Moore calls “nature-in-capitalism and capitalism-in-nature”. In the process he butchers the tools Marx developed for understanding the dynamics of capitalism. In this way Capitalism in the Web of Life muddles the very theory we most need to understand—and destroy—the system that brings both the global economy, and the Earth system itself, to the brink of destruction. Capitalism in the Web of Life is deeply thought-provoking and evocative. Yet Moore’s evocations never fulfil their promise. Instead the text quickly, on almost every page, brings in new concepts and frameworks which are again replaced before their full implications are discussed. The ceaselessly shifting theoretical terrain is made even harder to access by Moore’s appetite for riffing on the theme of Marxist phraseology. We read of the “tendency of the rate of ecological surplus to fall”, the “combined and uneven model of development [of human natures]”, “praxis of external nature”, “gendered surplus”, “accumulation by appropriation”, and “capitalism’s world praxis”.1 With this stream of neologisms, Moore regularly elides the degree to which his own work diverges from that of Marx. In the interests of space I will focus primarily on one aspect of Moore’s work—his relationship to Marx’s labour theory of value. Speaking endlessly of the “law of value” and the centrality of labour productivity, Moore nevertheless replaces the role Marx assigned human labour as the source of all value in the dynamics of capitalism with a notion that the energy and fertility of non-human nature is what drives economic growth and decline. This, very often subtle, break with Marx is embodied in Moore’s central conception of capitalism as a “Cheap Nature Project”,2 a system reliant on the “Four Cheaps” (labour, food, energy and raw materials).3 His use of the word “cheap”—denoting commodities with a low market price (and for Marxists as generally embodying less living labour)—­disguises the fact that what he is often referring to is the use value of naturally existing substances such as not-yet-mined coal or uncultivated fertile soils. Marx’s approach is quite distinct: “The determination of the market value of products, ie also products of the soil, is a social act, even if it is performed by society unconsciously and unintentionally, and it is based necessarily on the exchange value [ie embodied human labour] of the product and not on the soil and the differences in its fertility”.6 Bourgeois ideology and economics may wish coal could be turned into capital, but Marx showed that the only part of capitalist production that can increase the size of capital is exploited human labour. Marx was very aware that “nature really matters”, but it matters and interacts with capitalist commodity production in different ways from those proposed by Moore. The spectrum of fertility and scarcity cannot tell us about profits and losses. The capacity to extract more calories or kilowatts out of the environment may coincide with either massive investment and windfall profits, or with produce dumping, sackings and closures. We cannot understand what drives businesses into new rounds of production, new techniques and new frontiers (or indeed into new crises) without Marx’s version of value. Rather than argue for a break with Marx, Moore justifies this approach by repeatedly citing a single line from the Grundrisse where Marx writes: “Here, natural fertility of the soil can act like an increase of fixed capital”.12 Moore stresses that this insight was “no throwaway comment”.13 However, the full passage makes it perfectly clear that Marx believed the fertility of the soil could act like fixed capital in the agricultural sector only in situations where the capitalist mode of production is not yet fully established.14 Yet this forms the key to Moore’s understanding of capitalism right up to today. Once Moore parts ways with the labour theory of value, he discards the fundamental key to Marx’s critique of capitalism. Marx was only too aware of the ways in which the capitalist mode of production prioritises some human labours, and some of the Earth’s wealth, over others. What Moore misses is that these laws are not value judgements made by capitalists, but rather the dynamics that all capitalists are ruthlessly subjected to in their blind competition with each other. It is competitive accumulation—a force rarely mentioned by Moore—that drives capitalists and states to develop chemical and biological production processes that will be unleashed, even if the consequence is a sea full of plastics and air full of carbon dioxide. It is competition that drives capitalists endlessly to increase the value and sophistication of constant capital. In the process they tend to undermine the very basis of both economic growth and the profitability of their sector16—exploited living labour. Alongside the notion of the Cheap Nature strategy, Moore’s main theoretical contribution of Capitalism in the Web of Life is his concept of the “oikeios”, “the creative, generative, and multi-layered relation of species and environment”.17 Moore proposes this as a method for escaping what he understands as the “Cartesian” (or modern) dualist separation of society and nature. Instead of thinking of capitalism “acting on” nature, the oikeios asks us to remember that capitalism is a part of nature, and that the geological, chemical and biological environments shaped by capitalism are therefore no less “natural” than any other. The problem with Moore’s use of the oikeios is not that it attempts to bring our understanding of capitalism and the natural world into the one frame; at one level he is right to say that the stock market is a way of organising nature. The problem is his assertion that we can understand the operations of this totality with a single, unified theory. As seen above, Moore proposes that the processes of commodity production described by Marx (which, as I have argued, Moore diverges from significantly) need to be understood as resting on a broader base of processes he names “appropriation”. While he sometimes describes the economic moment as “pivotal”, in fact for Moore the driving dynamic of the oikeios is not commodity production but (what he sees as) the “extra-economic” processes that strive to uncover new Cheap Nature—science, rationalisation and colonial expansion. In Moore’s “dialectic of productivity [exploitation] and plunder [appropriation]”, plunder is firmly in the driving seat. If Moore’s work were simply aiming to explore the ways that limits to commodity production are continually set by nature (itself produced in part by human history), and then often overcome in processes that unleash unforeseen consequences (regularly devastating for humans and the rest of nature), the oikeios would be a useful concept. However, this part of Moore’s work amounts to a materialist determinism—new wealth discovered that eventually wears out over a hundred years. Ultimately Moore’s long-wave meta-theory, and concepts such as the “tendency of the ecological surplus to fall” cannot explain the dynamism, flux and devastation of historical capitalism. For this we need Marx’s theory of the tendency of the rate of profit to fall—the very dynamic Moore abandons with his rejection of the labour theory of value. For all their provocative promise, Moore’s departures from Marx do not leave us better equipped to understand, and intervene in, the crises we face. It is the relentless search for profitability that explains why the economy is mired in seemingly permanent stagnation after the crisis of 2008. It is the unequivocal need for short-term profits that stymies action on climate change and continues the drive to ever more environmentally destructive production techniques. Marx, and not Moore, created the analytical tools needed to explain the dynamic that drives our system to the brink of ecological and economic devastation. Jean Parker is a researcher and member of Solidarity in Australia. ↩ Moore, 2015, pp91-109; 111; 112; 134; 145 and 150. ↩ Moore, 2015, pp241; 96-97; p71. Emphasis in the original. ↩ If we take what Moore proposes to be the most recent “long century” of accumulation (1870-1980)—Moore, 2015, p120. Moore is asking us to accept that for over 100 years energy, food and raw materials and labour power were all consistently cheap (p54). His depiction of these “inputs” into production as use values forgets that they too are produced by capitalists as commodities, and indeed only produced to the extent that a reasonable rate of profit can be made. ↩ The relevant passage reads: “This contradicts the law of the development of capital, and especially of the development of fixed capital. Such a progression can take place only at stages where the mode of production of capital is not yet adequate to it, or in spheres of production where it has assumed predominance only formally, eg in agriculture. Here, natural fertility of the soil can act like an increase of fixed capital—ie relative surplus labour can grow—without the amount of necessary labour diminishing (eg in the United States). The gross profit, ie the surplus value, regarded apart from its formal relation, not as a proportion but rather as a simple magnitude of value without connection with any other, will grow on the average not as does the rate of profit, but as does the size of the capital. Thus, while the rate of profit will be inversely related to the value of the capital, the sum of profit will be directly related to it. However, even this statement is true only for a restricted stage of the development of the productive power of capital or of labour”—Marx, 1973, p748 (my emphasis). ↩ Perhaps unsurprisingly Moore completely mischaracterises Marx’s theory of the tendency of the rate of profit to fall, as arising from intensified competition—Moore, 2015, pp141-142. ↩ Moore, 2015, pp96; 152; 101. ↩ In footnote 16 on page 95 Moore acknowledges that we cannot measure the worth of things outside the commodity system. Yet Moore’s theory of appropriation rests on the ratio between this and the size of the circuit of capital. Moore’s approach of sliding between using price, calories and mass to compare these only illuminates the problem. ↩ Moore adopts the “long centuries” periodisation proposed by Giovanni Arrighi (1994) with the rather unsatisfying statement: “I make no pretence that [Arrighi’s long centuries] are the best possible; they are simply the most reasonable I could find. This book does not reconstruct the narrative because I do not think we know—yet!—how to reconstruct that narrative”—Moore, 2015, p120. ↩ Moore, 2015, pp112-113. Quantism here refers to the way in which natures are made quantifiable in order to be incorporated into financial markets. Arrighi, Giovanni, 1994, The Long Twentieth Century: Money, Power, and the Origins of Our Time s (Verso). Marx, Karl, 1991, Capital, volume 3 (Penguin Classics). Moore, Jason W, 2015, Capitalism in the Web of Life (Verso). Jean Parker is a member of Solidarity in Australia, and a Research Associate at the University of Sydney, Department of Gender and Cultural Studies.